NLB's Kind Gesture - Thank You for the Present! Most of us are familiar with the Armenian Church along Hill Street. 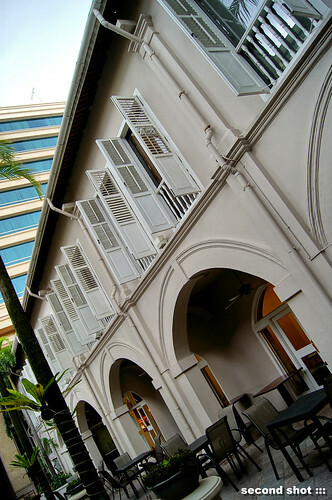 Designed by G.D. Coleman and built in 1835, it is currently the oldest church in Singapore (it was not the first church to be built however; the honour belongs to the Roman chapel at the SJI site) and a national monument. In 1836 it was dedicated to St. Gregory the Illuminator, the first patriarch of the Armenian Apostolic Church. Today the full name of the church is the Armenian Church of St. Gregory the Illuminator. Interestingly St. Gregory the name does not only live on in the Armenian Church, his name actually graced a street opposite the church flanked by shophouses. 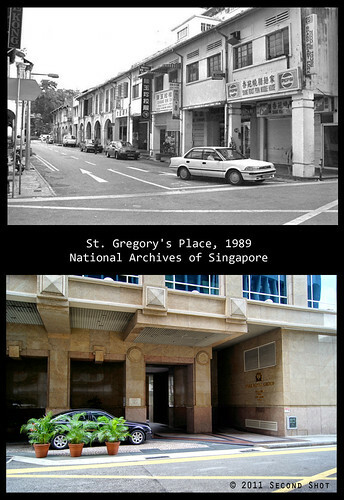 I stumbled upon the lost heritage by accident while looking for second shot opportunities of St. Gregory's Place beside the Singapore Chinese Chamber of Commerce and Industry building. You know it is a lost cause when you realize the site is now occupied by a hotel, the Grand Park City Hall. From Hill Street, you see only the hotel and what looks like a garden in some sort of courtyard. St. Gregory's Place would have been demolished, right? Imagine my surprise when, to satisfy my curiosity, I stepped into the courtyard. Lo and behold! Shophouses appeared to my left and right. This is the little gem in town, a heritage lost to many; honestly this is the first time I know of their existence. From the URA website, I learnt these are conserved buildings, not demolished and rebuilt like the shophouses in Bugis Junction. Another Bugis Junction wannabe in town? Nope, these are real but conserved buildings! Looking out to Hill Street from the lush courtyard. The gem is tucked in the courtyard some distance away from the pedestrian walkway. On this side of the courtyard, I think you can find Spa Park Asia. Anybody tried the spa before? Ladies? 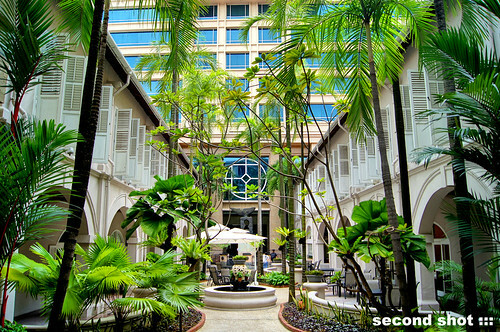 According to the website, the "holistic experience begins the moment you walk through The Courtyard and enter the spa". On the other side I think will be where their restaurant - Indulge at Park - is located. 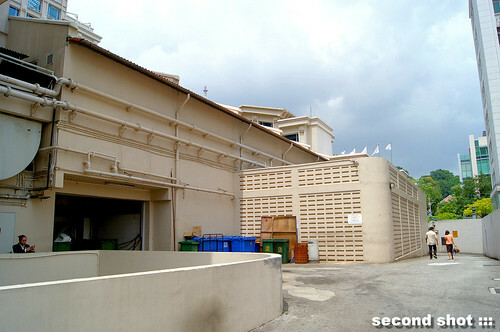 Behind these shophouses is the atrium which faces a waterfall. The new in the old or the old in the new? 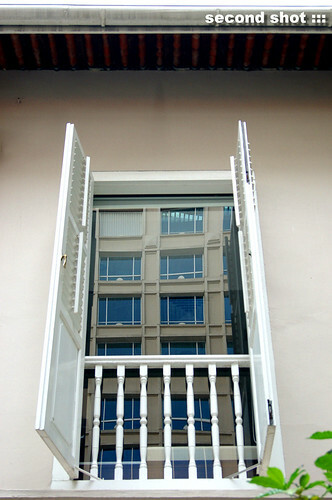 As the shuttered windows open in the post-conservation era, the world will never be the same again. The staircase added during the conservation. Behind would be the waterfall facing the atrium. 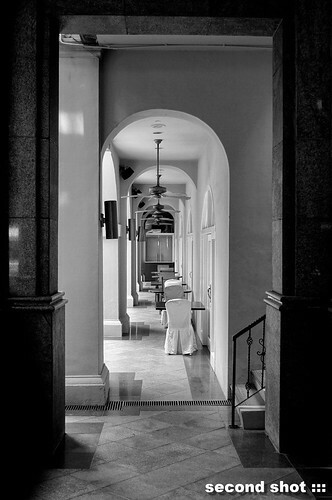 The corridor below the staircase with dining tables and chairs from Indulge at Park? 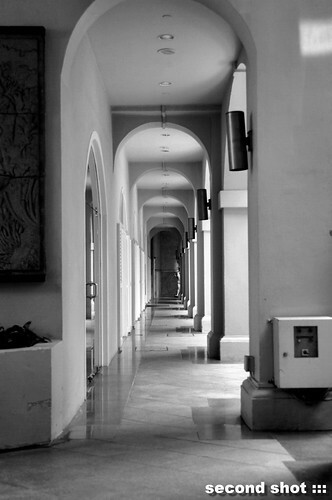 The corridor where I think their spa - Spa Park Asia - is located. 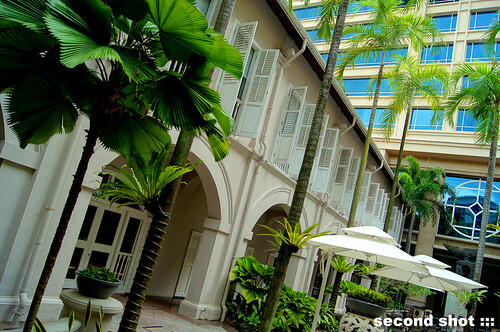 This would look like a scene from Bugis Junction except St. Gregory's Place (the courtyard) is not covered. 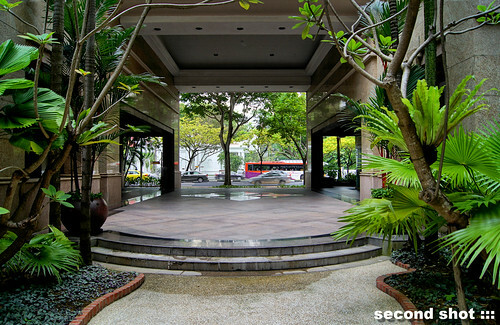 I didn't know it then that the courtyard is a thoroughfare to Peninsula Plaza behind the hotel. You wouldn't know it unless you walk right up to the end and through the hotel building. To check that it was really Peninsula Plaza behind as old photos show the building right smack at the end of the street (from Hill Street your view is blocked by Grand Park City Hall), I made a detour via Coleman Street and Coleman Lane, the backlane of Peninsula Plaza. There, I discovered the shortcut connecting Hill Street and Coleman Lane which eluded me for many years. You can see the shortcut in my second shot at the top of this article. 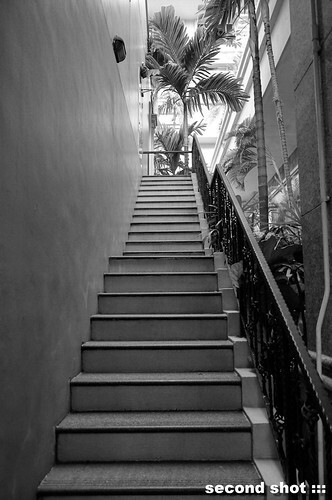 The unnamed lane between the St. Gregory's Place shophouses and Singapore Chinese Chamber of Commerce and Industry building. 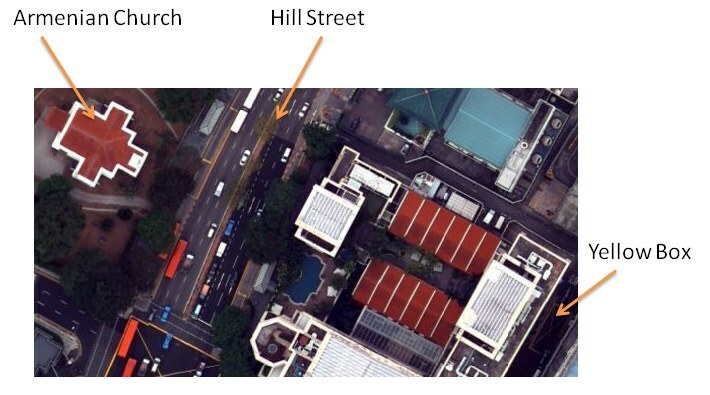 I think after you exit from Peninsula Plaza car park, your car can take either Coleman Lane to North Bridge Road or this lane to Hill Street. The yellow box marking in my second shot is a bit of an oddity. In the 1989 photo we see it at the junction of Coleman Lane and St. Gregory's Place. Today the marking is still there but the junction has disappeared. On the Peninsula Plaza side where I took the photo there was this loading/unloading area for goods and if I remember correctly beside it was the car park entrance. So was the marking drawn to prevent vehicles from obstructing St. Gregory's Place or Peninsula Plaza? Meanwhile I will have another post about them. Came across this post and thought the arched gateways of the shophouses looked familiar. I happened to have these old shots (c. 1989) of probably the same shophouses, but from the Armenian Church side. Didn't realise they've now been "encased" inside the hotel. The Geek, are you my friend from facebook CK? Great shots, this is the first time I'm seeing these shophouses in *color*! Do share if you have more of such photos. Let's see if I can do a second shot.